Radio Liberty. Fri, 19 Apr 2019 04:34:14 +0000. Washington Times. Thu, 18 Apr 2019 06:31:26 -0400. Al Jazeera. Thu, 18 Apr 2019 08:20:40 GMT. Andrew Wu. Sydney Morning Herald. Thu, 18 Apr 2019 18:00:03 +1000. Tom Barnes. The Independent. Thu, 18 Apr 2019 06:41:29 GMT. Tass. Thu, 18 Apr 2019 09:25:00 +0300. ABC News. Wed, 17 Apr 2019 13:59:41 -0400. BBC News. Wed, 17 Apr 2019 11:01:08 GMT. BBC News. Mon, 15 Apr 2019 16:47:27 GMT. Gabriel Dominguez, London. Janes 360. Mon, 15 Apr 2019 00:00:00 GMT. Jerusalem Post. Sun, 14 Apr 2019 23:38:08 GMT. 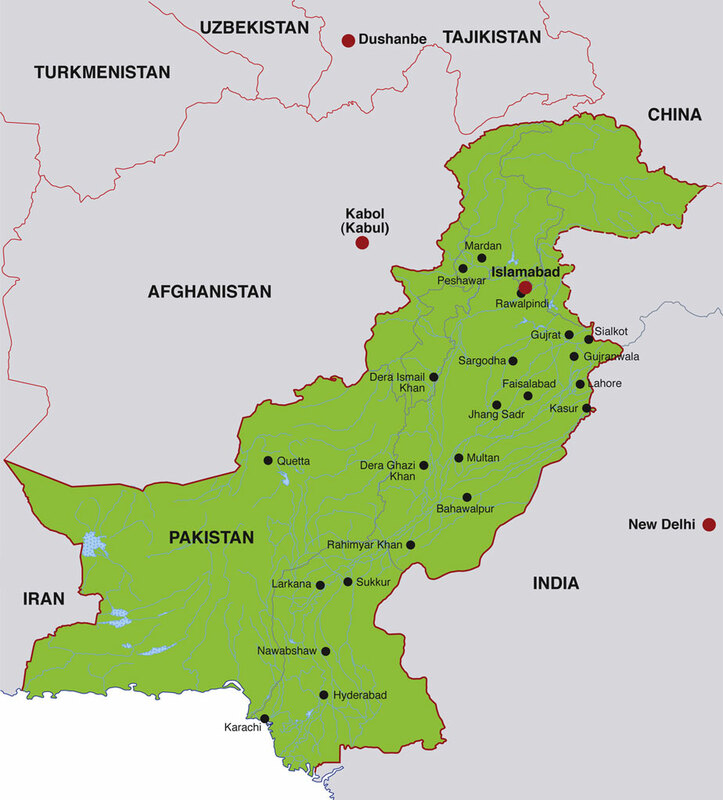 The Islamic Republic of Pakistan is an Asian country, located between India to the east, Afghanistan and Iran to the west, and China to the north. Its capital city is Islamabad, and its largest city is Karachi. Pakistan's currency is the Pakistan Rupee. The primary languages used in Pakistan are Urdu and English, and in 2007, Pakistan's estimated population was 164,742,000. Approximately 55% of Pakistanis are Punjabi, 14% are Pashtun, 14% are Sindhi, 8% are Mohajir, and 9% are other ethnicities. For more news and information about Pakistan, visit the official Pakistan government website. Click on the small Pakistan map shown at right to display a full-size map of Pakistan.